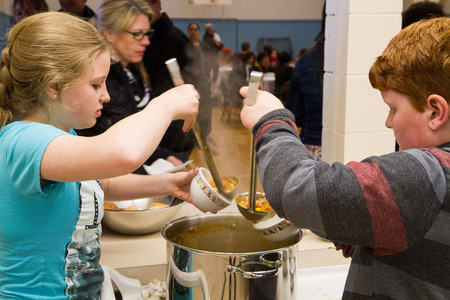 On Sunday, May 4, 2014 Infusion Champion School St. Joseph's Elementary hosted an event they called Stone Soup. 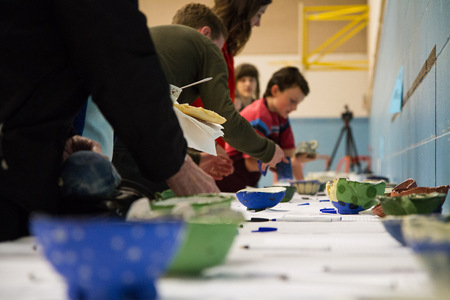 Based on the folk tale in which a hungry stranger persuades a local town to band together to feed the hungry by each contributing what they can, the event represented the culmination of a lot of effort on behalf of the school's educator, student and parent communities, as well as the guidance of Infusion Teaching Artist Ewa Sniatycka. The idea for the event all began with the students attending We Day in Vancouver last October. From there, the Grade 6s and 7s spent a lot of time reflecting on the role they can play in helping make the world a better place. This coincided with their examination of the Stone Soup story, as well as a number of ongoing entries in their visual journals with social justice themes. 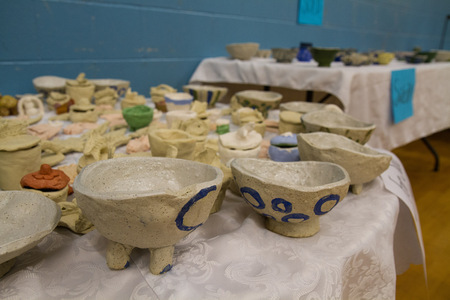 By the time the dust cleared on their May 4th event, the students had generated and successfully executed their plan to create and auction off almost 100 handmade clay bowls and objects of art, take responsibility for the content creation for the marketing of their event, make and serve their own delicious version of Stone Soup and collect and send the proceeds to both Harvest House Food Bank in Chemainus and a school they are helping to build in Africa. Hannah, a student in Grade 7, did an amazing job of speaking with me about the project from her perspective and sharing the many different opportunities the project offered for learning. "I'm really glad we learned all about clay, but we also learned about social studies because of the social justice element, we learned through language arts for all the writing we had to do in our journals and for advertising the event, math because we had to keep track of ledgers for ordering and pricing out the clay and figuring out how much we needed based on weights and measurements and science because we learned all about chemical reactions that happen with clay and glaze when you make pottery. We even learned about how to properly fire clay, and what happens to the clay and glazes when things are over - fired. We had an accident with one of our firings and a lot of our stuff broke or got bubbles in it. Some of it survived and Ewa showed us how to fix the pieces a little so we've put them up for sale by donation. It was disappointing at first but we learned from it and started again. It's been really awesome." Infusion Teaching Artist Ewa Sniatycka also came out for the event and commented. "This is an amazing representation of how arts based learning can also promote and support community engagement. 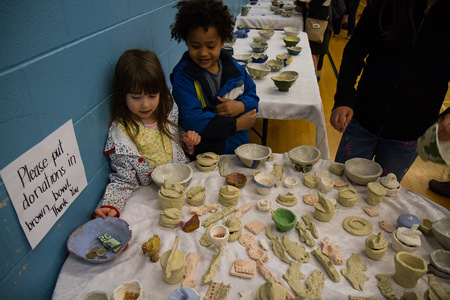 It's community through clay! I have to admit it's really exciting for me to see all the work and effort everyone has put into this project all on display in the form of their bowls and sculptures. To see it all at once and all in one place … it's wonderful." Infusion Champion School teachers Rebecca Wall, Deb Cadwallader and Brenda Hennig helped to guide the project, which saw involvement from both Kindergarten students and students in Grades 6 and 7. 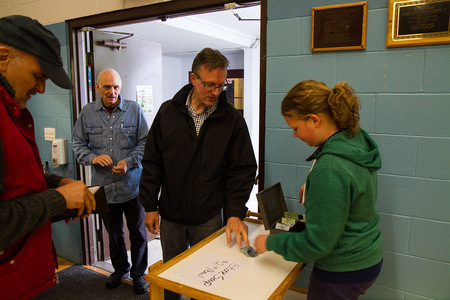 "This project really activated the idea of community for our students. 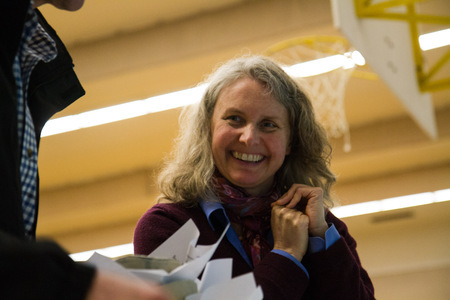 There were so many valuable learning opportunities for the students and for us," Brenda shared. Deb added, "I always felt like making things with clay was the easy part but avoided it because of the firing process. I feel much more confident now about working with clay, and with the kiln as well. Having Ewa to work with us has been great. Now I really feel more sure of myself with the firing end of things. I was always nervous about doing clay because of this, but now, after this experience, I know I can work with clay with more confidence. It's a wonderful medium for the students to learn through." The event was a lot of fun, and a great opportunity to talk with those responsible, including principal Bern Muller who came out to support his teachers and the students, and shared from his perspective what a positive impact the event, which came about through their Infusion Cohort involvement, has had on the learning community at St. Joseph's. The bowls we won in the silent auction, in spite of the considerable competition, are now on display in their new home at ArtStarts. Feel free to come visit them and learn more about this and other exciting projects happening all over BC the next time you are in the neighborhood. Learn more about the Infusion Cohort program. Read more blogs about Arts Integration in Action!